By William Mackay: Super Zab Judah (41-6, 28 KO’s) says that he’s ready for the best ‘A’ game that WBA light welterweight champion Amir Khan (25-1, 17 KO’s) has got on July 23 at the Mandalay Bay Resort & Casino, in Las Vegas, Nevada. Judah, 33, has resurrected his career at light welterweight with the help of boxing legend Pernell Whitaker, who has made changes in Judah’s game to make him more elusive than he was in the past. Next month Judah is facing a fighter that is younger, faster and bigger than him in 24-year-old Khan. However, Judah has the advantage in experience, defensive ability and perhaps a slight advantage in the power department. The power game could be Judah’s best bet to win this fight, because he’s going to have a problem matching Khan’s work rate with his judge-pleasing flurries. Khan likes to throw his flurries late in the rounds the way that Oscar De La Hoya used to do, and he often wins rounds by throwing these shots, even when 90% of the punches miss. Winning rounds may prove to be tough against Khan unless he fades like he did in the last three rounds of his fight against Marcos Maidana last year, and how Khan seemed to be tiring at the midpoint of his last fight against hand-picked opponent Paul McCloskey. 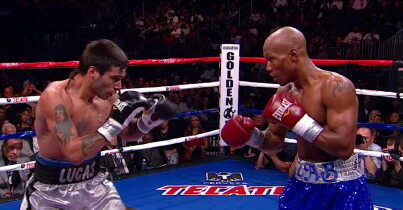 Khan seemed to tire out from missing with his shots against the defensively minded McCloskey. Judah is an even better defensive fighter than McCloskey, and if he’s looking to make Khan miss all night, we could see Khan fading by the 5th round. In that case, it would be up to Judah to take charge of the fight if he has enough energy left to take the fight to Khan. Judah isn’t making a prediction for the fight, but he obviously is aware that he may have to score a knockout over Khan to get the win. He can’t match Khan for his work rate, not at this point in his career. He’ll have to set a trap for Khan like he did with his last opponent Kaizer Mabuza in March. Judah won that fight by a 7th round TKO after catching Mabuza with a big left uppercut while backed into the corner.